I think you’ll agree with me when I say that every time I blink, it feels like the trees on my property grow new branches. While I know better now, I used to think there was nothing I could do about it. Boy, was I wrong. I shouldn’t be surprised, but experience has taught me that the right tool is the best way to keep any task under control. While loppers have been a great addition to my pruning toolkit, I had first to figure out what all the different options available meant. Knowing how confusing the lopper world can sometimes be, our guide will first walk you through everything you’ll need to know about loppers and then show you what we consider to be the best loppers on the market. There’re two main things to keep in mind when choosing a lopper. First, you’ll need to have a reasonable understanding of how you expect to use your lopper. As no two situations are the same, different scenarios may call for different types of loppers. Second, it will help to understand more about the industry jargon. From anvils to bypass to ratcheting, the lopper world tends to be a bit confusing. We’re here to help bring some clarity. When it comes down to it, there are two main different types of loppers: bypass and anvil. Bypass loppers feature an upper cutting blade that slices past a fix lower jaw, which is similar to how scissors operate. They are the most common kind of lopper and they are great for making clean cuts on green tree limbs. Unfortunately, they are not ideal for cutting dry or dead wood as that can damage or bend the blade. On the other hand, in a manner similar to the way a knife strikes a cutting board, anvil loppers have a blade that stops at a cutting surface that runs perpendicular to the blade. They are ideal for cutting harder branches as the lower jaw can provide better leverage in comparison to bypass loppers. The reality is that the cuts aren’t usually terribly clean, as an anvil lopper relies on crushing the plant limb as well as cutting it. As such, anvil loppers are best used for cutting dried or dead wood. When evaluating loppers, one of the most important things to keep in mind is that blade quality matters a lot. While this is no surprise, soft blades will dull quickly and may need frequent re-sharpening. It would be best to look for high carbon steel blades, as that type of steel is generally more durable and will last longer. It’s also important to keep in mind that sometimes blades are treated with a coating. This coding can be useful when cutting trees like pine trees as the sap from the branches could otherwise lead to accidental blade damage. Also, consider checking out the closeness of the blades and whether they are adjustable. Having a lopper with adjustable blades could be beneficial for maintenance purposes. Regarding the cutting mechanism for loppers, some loppers utilize only brute force but there are some alternatives available that leverage mechanical features. More specifically, the three most common types of mechanical loppers are ratcheting, compound action, and geared loppers. Generally speaking, geared and compounding loppers are able to achieve very high cutting forces and are great options for professionals looking for that extra oomph. Ratcheting loppers can tackle large branches and they aren’t overly complicated to operate, therefore they are well worth considering. While the truth is that it will take longer to complete a cut based on the pumping mechanism, the real benefit is that they allow you to let go once ratcheted. This means that you won’t necessarily have to complete the full cut at once. Therefore, ratcheting loppers could be considered a good option for those with less arm strength or those looking to tackle large branches. While sometimes it’s better to go with a long handle, that isn’t always the case. Longer loppers can tend to be unwieldy and sometimes awkward to operate though it is true that they can reach further and the extra length adds leverage. The truth is that the rights handled length for you will depend upon your application and arm strength. Telescoping handles might be a good option for those who are looking for a longer lopper but don’t always want to deal with the unwieldy long handles. While telescoping handles do a great job providing flexibility, you should be wary that they usually aren’t as structurally sound as single piece handles of a similar length. This means that it is possible they might bend if too much force is applied. The last thing to keep in mind is to carefully consider the diameter of the branches that you expect to typically cut. While it may be tempting to get the largest pair of loppers you think you might possibly need, it might be best to pair a medium size a lopper with a pruning saw capable of handling the large branches. As always, there isn’t one lopper that is made for every job and not everyone needs the same lopper. Knowing that the lopper world can be a bit confusing to navigate, we took the time to find the best of the best. Here are our favorite loppers. Coming from Corona, a brand with more than 90 years of experience designing high-quality garden tools, this 32″ anvil lopper is built for professional grade applications at an affordable price point. By utilizing compound action this tool is able to triple your cutting power and long handles add additional leverage. Simply put, these loppers are a great value for your money. While it is true that the cutting capacity is a little limited in comparison to other models, this pair of loppers is still highly effective when used correctly. It’s important to note that a few users have had some issues with blade durability, though that may not necessarily be a surprise given the low price point. These loppers would be a great choice for those just getting started with pruning and not looking to invest a bunch of money upfront. As they are anvil-style loppers, they would be a good choice for those who are expecting to mostly cut dead or dry wood and don’t necessarily need a super clean cut. From the well-respected Fiskars brand, these 32″ PowerGear2 loppers utilize hardened steel blades and a patented cam and gear cutting mechanism to increase performance. Using a bypass-style blade system, these loppers are well designed for those who are looking for clean cuts. These bypass loppers are an affordable option and can be quite powerful when used in the correct circumstances. Keep in mind that due to the cutting mechanism, the handles on these loppers will have to be opened to almost 180° and therefore they might not be a good choice for those who are pruning in tight situations. Also be aware that some users have reported blatant durability concerns though that is not unexpected at this price point. 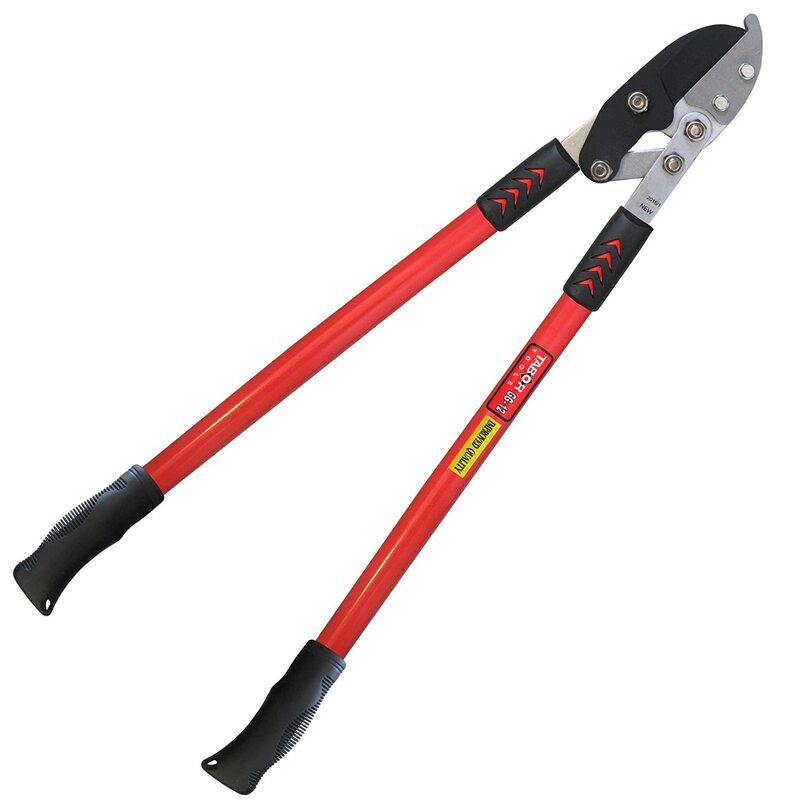 These loppers would be a good choice for those who don’t expect to be pruning in dense trees and are looking for an affordable option. Therefore, these lockers might be a good choice for people just getting started out pruning and don’t expect to spend a ton of time trimming trees. As they are bypass loppers, these would be a good option for those who are concerned about making clean cuts on green limbs to preserve the health of the tree. Featuring a heavy-duty carbon steel blade and a low-friction coating, these anvil loppers from Tabor Tools have some serious cutting potential. Able to prune branches of up to a 2″ diameter, these loppers use compound action to increase the cutting power you can generate. These anvil loppers are very highly regarded and offer serious performance at a relatively affordable price point. As they utilize an anvil blade style, these loppers are a great choice for those who expect to be cutting a lot of dead or dry wood. 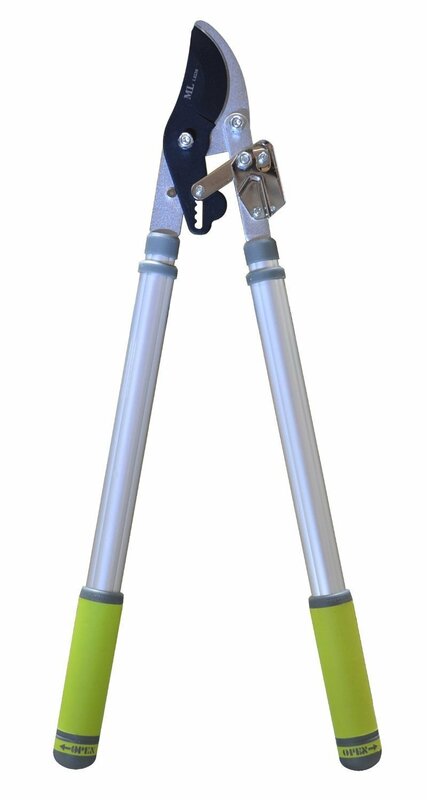 Users of a variety of size and strength have noted that these loppers are quite easy to use. As such, these loppers would be a good choice for people who expect to semi-frequently need to prune trees on their property. Everything indicates that these are a highly durable set of loppers and you can expect them to perform well for years. Made for serious work by the reputable A.M. Leonard company, these 32″ compound action bypass loppers are among the best available on the market. Featuring a blade made from high carbon steel that is heat-treated, these loppers can easily make very clean cuts on green limbs. Without a doubt, these bypass loppers are designed with the professional arborist in mind. 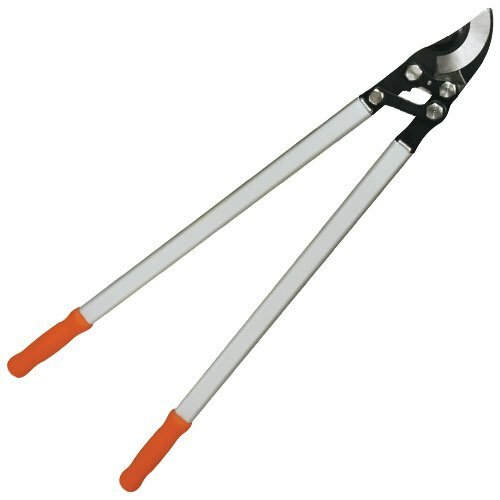 While the truth is that these loppers are priced too high for most to reasonably consider them, they would be a wonderful choice for those who prune trees professionally or maintain a small orchard. As the high-end version of the bypass lopper, these can very easily make extremely clean cuts on green limbs due to their really sharp blades. The lightweight aluminum handles and comfortable grips are great features and they make these loppers very easy to use. While a relatively new brand on the market, MLTOOLS offers these ratcheting extendable loppers built for those looking for maximum versatility. 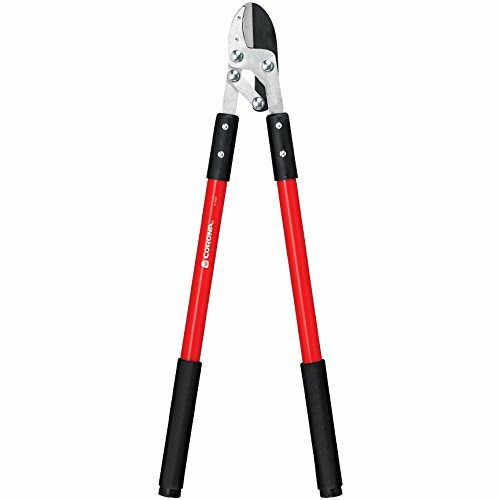 Able to extend to a total length of 39.5″ and capable of cutting branches up to a diameter of 1.75″, these loppers offer great performance for the price. An affordable option that carries some serious versatility, these ratcheting loppers are a great choice for those looking for great all-around performance at a friendly price. The extendable handles are a great feature not just because they can extend to a 39.5” length, but also due to the fact that these can take up less space in storage. While the telescoping handles are a great feature, it’s important to point out that when fully extended they are not as strong as a single piece handle. While obvious, this is good to keep in mind in order to avoid bending the handles from improper use. Due to the affordable price point and the great versatility provided by the handles, these bypass loppers would be a great option for many. While it was a tough call, our favorite pair of loppers featured in this post is the Ratcheting Extendable Bypass Loppers from MLTOOLS. As the functionality and application of anvil loppers are fairly different, it’s good to note that our favorite anvil loppers would be the GG12 Anvil Loppers from Tabor Tools. Coming in at a budget-friendly price point and offering a lot of versatility, the MLTOOLS bypass loppers would be a great tool for many. Used correctly, the ratcheting mechanism and telescoping handles help this bypass lopper easily handle small branches.